One must always be grateful for simple satisfactions: It's Sunday morning, a promising warm breeze wafts through the window, birds are chirping away predictably (it is springtime, after all), and I am sitting at my computer with a trusty cup of coffee, enjoying a bit of pleasure reading as I meander through my favorite food and travel blogs. Naturally, a brick of a law book sits just beyond my reach, but it can wait another minute while I tell you about my favorite new discovery: Wayfare Magazine. I came across it thanks to Prêt à Voyager's Anne Ditmeyer, who also writes for Wayfare. Let me preface the upcoming bubble of enthusiasm by saying that they did not ask me to write this post and I am not getting any perks for gushing about it - I simply gush naturally when I come across something I love. 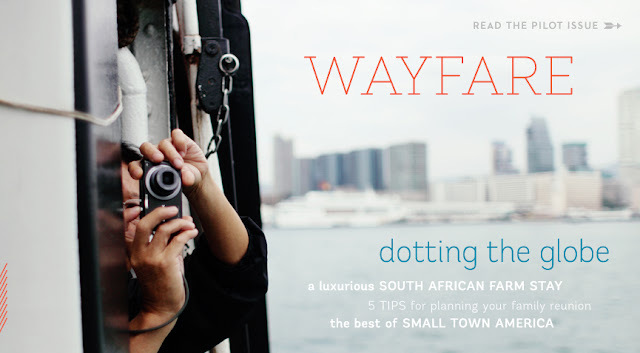 And what I love about Wayfare is that it has the feel of a well-designed print magazine, only you can click on links within the articles and explore their content in a much more engaging way. For example, I discovered a fun, new (to me) French pop group, Yelle (on page 15), and enjoyed listening to their new album as I scrolled through the magazine. As for Wayfare's content, it's a collection of stories, beautiful photos, tips, and lots of eye-catching little tidbits that will inevitably inspire you to grab a bag and travel. I could never imagine giving up print publications entirely - I still feel a surge of excitement with each New Yorker that arrives in the mail - but I also love the fact that we can now enjoy print-quality magazines in electronic form and offset some of that "paper guilt."